Does the Bible say anything about education? 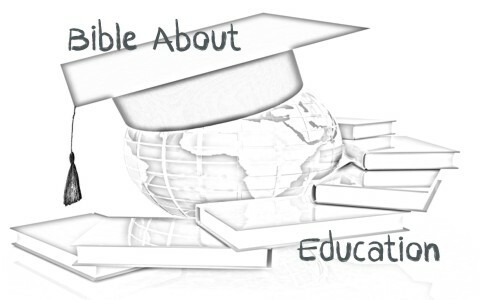 It most certainly does and here’s a Christian study on the subject of education. The Bible is pro-education but it must be tied to godly wisdom or it turns out to be foolishness. Just a quick reading of the proverbs tells us that. Moses was no exception as it was written of him “At this time Moses was born; and he was beautiful in God’s sight. And he was brought up for three months in his father’s house, and when he was exposed, Pharaoh’s daughter adopted him and brought him up as her own son. And Moses was instructed in all the wisdom of the Egyptians, and he was mighty in his words and deeds” (Acts 7:20-22). This education served Moses well when he started to help administer the civil laws and codes for the nation of Israel. He also acted as a judge for the people. The science, law, architecture, writing, history, mathematics, and other disciplines were all part of the educational system of Egypt and must have come in handy for his dealings with Israel in the Wilderness. The building of the tabernacle, the writing of the laws and codes, the sanitation laws, and so on would have been next to impossible if Moses had not been highly educated. Paul studied under one of the most brilliant men of all time. His name was Gamaliel. Paul said of himself that he was “a Jew, born in Tarsus in Cilicia, but brought up in this city, educated at the feet of Gamaliel according to the strict manner of the law of our fathers, being zealous for God as all of you are this day” (Acts 7:3). Paul continued in his writings to the church at Philippi saying “If anyone else thinks he has reason for confidence in the flesh, I have more: circumcised on the eighth day, of the people of Israel, of the tribe of Benjamin, a Hebrew of Hebrews; as to the law, a Pharisee; as to zeal, a persecutor of the church; as to righteousness under the law, blameless” (Phil 3:4b-6). Paul, according to early church historians and biblical scholars, may have been the greatest mind of his time. Few could out-whit him, out-debate him and exceed his knowledge of the law and of the Scriptures. If education was bad, then why did God use Paul as one of the greatest of all apologists and Bible (Old Testament) scholars, specifically when he reasoned with the Greeks from their own poets on Mar’s Hill (Acts 7:22-34)? Wouldn’t you have loved to hear that message? The Book of Proverbs, Song of Solomon and the Book of Ecclesiastes, were all called “wisdom literature” and for good reason. Solomon is also known to have written some of the psalms as well. There was such godly wisdom in these books. Why? It was because Solomon prayed to God for wisdom (1 Kings 3:9) and not for riches or honor so God gave him both (1 Kings 3:11). This prayer for wisdom was very pleasing to God because there is more value in education, particularly regarding the fear of the Lord, than there is in all the gold mines and treasure houses in the world. It was said that “Solomon’s wisdom surpassed the wisdom of all the people of the east and all the wisdom of Egypt” (1 Kings 4:30). In fact, he “was greater in riches and wisdom than all the other kings of the earth” (1 Kings 10:23). He said to himself “I have increased in wisdom more than anyone who has ruled over Jerusalem before me; I have experienced much of wisdom and knowledge” (Eccl 1:16). Daniel was only a teenager when he was brought into captivity with the rest of the captives of Israel. It was said of Daniel that “In every matter of wisdom and understanding about which the king questioned them, he found them ten times better than all the magicians and enchanters in his whole kingdom” (Dan 1:20). There were 3 men in particular and 4 counting Daniel of which it was said “God gave them learning and skill in all literature and wisdom, and Daniel had understanding in all visions and dreams” (Dan 1:17). Daniel’s wisdom or education exceeded that of everyone in Nebuchadnezzar’s kingdom of Babylon, over and above that of the magicians and enchanters, specifically in the “whole kingdom” and not just slightly over them but “ten times better!” It’s no wonder then that “the king gave Daniel high honors and many great gifts, and made him ruler over the whole province of Babylon and chief prefect over all the wise men of Babylon” (Dan 2:48). King Nebuchadnezzar would have never put someone in charge of Babylon that was not qualified to run such a mammoth and complex nation if he didn’t feel that he wasn’t educationally qualified to do so. Clearly, knowledge begins and ends with the fear of the Lord, which means a deep, abiding, holy reverential fear and respect. It takes godly wisdom to build and have understanding to be established and it is only by knowledge that true riches are acquired and the true riches are found not only in the wisdom literature but in the whole Word of God, starting in Genesis 1:1 to Revelation 22:21. In between these pages you will find no greater wisdom, education, and knowledge in the entire world. James reminds us that education or wisdom, not exactly the same thing, can be received by God as he writes “If any of you lack wisdom, let him ask of God, that giveth to all [men] liberally, and upbraids not; and it shall be given him” (James 1:5) however the “wisdom of the world is foolishness to God” (1 Cor 3:19) but godly wisdom is of great value. I have heard of many an educated fool. God mocks the educated fools of the earth through Paul writing “Where is the one who is wise? Where is the scribe? Where is the debater of this age? Has not God made foolish the wisdom of the world” (1 Cor 1:20). In time God “will destroy the wisdom of the wise” (1 Cor 1:19) for it was by “Professing themselves to be wise, they became fools” (Rom 1:22). It is better to seek “the wisdom from above [which] is first pure, then peaceable, gentle, open to reason, full of mercy and good fruits, impartial and sincere” (James 3:17). Well written. It explains the need for education in this world but it has to be guided by godly wisdom.